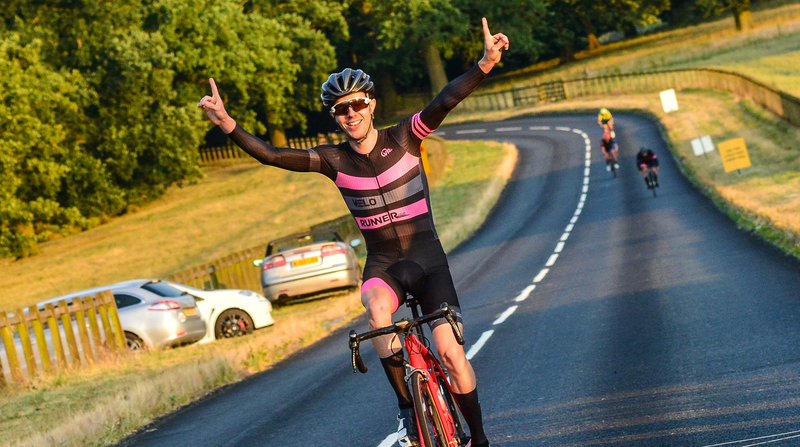 Will Corden (Velo Runner) timed his winning effort to perfection and charged to his maiden victory of the South Staffordshire and Shropshire Road Race League. The first category rider from Stone led a one-two-three by local riders at the Swynnerton circuit, in Staffordshire, used by the series for the first time this season. Corden launched his winning move in the final mile from a select leading group and charged up the finishing climb to claim the win. With Pro Vision Racing riders organising the three lap race over 35 miles the scratch group had a different look to usual. However, with several visiting riders bidding for the win they worked well together averaging 27.5 miles per hour over the undulating terrain. They caught the slower groups set off ahead of them due to the handicapped format with just over 10 miles remaining. As they approached the finishing climb with a lap remaining Grant Bigham (Velo Runner) launched an attack with overall leader Kirk Vickers (Rhino Velo RT) and team-mate Matthew Garthwaite chasing along with Jack Stanton-Warren (Wheelbase Castelli MGD) leading to the race coming back together. Over the undulating back half of the circuit Stuart Glover (Rhino Velo RT) and Chris Bailey (KTM MTB UK) made a bid for victory and built up a sizable gap. Noticing that the race was going away from them Velo Runner team-mates Corden and Bigham bridged the gap. Coming into the last mile Corden made his bid for home and had time to celebrate the victory with Bigham winning the uphill sprint for second. A fifth place for Vickers meant that he increased his overall series lead and has a substantial margin heading into the final three rounds. Fastest veteran was Matthew Morris (Wolverhampton Whls) in eighth although Philip Glaze (Stourbridge CC) still has a healthy lead in the overall veteran’s competition. despite helping at the latest round.